Preheat the oven to 375˚F / 190˚C. Place the potatoes on a rack on a baking tray and bake for about 1 hour and 20 minutes, or until cooked through (I baked in the conventional microwave oven for about 30-40 minutes at Conv + MW 180˚C+50 MW power). Let rest for about 15 minutes, or until just cool enough to handle. Peel and puree in a ricer using the finest disc (I used fine side of a vegetable grater). Spread evenly on the baking tray and let cool to room temperature. Transfer the potato puree to a large bowl, season to taste with salt and pepper, and stir in the egg. Stir in the flour. Transfer to a work surface and knead briefly until smooth. Cut the dough into eighths. Roll 1 portion of dough into a ½-inch thick rope and sprinkle lightly with flour. Using a knife, cut the rope into ½-inch pieces. Roll 1 side of each piece of dough against a lightly floured gnocchi board or the back of the tines of a fork, pressing the other side lightly with your thumb as you roll. Make more gnocchi with the remaining dough in the same manner. 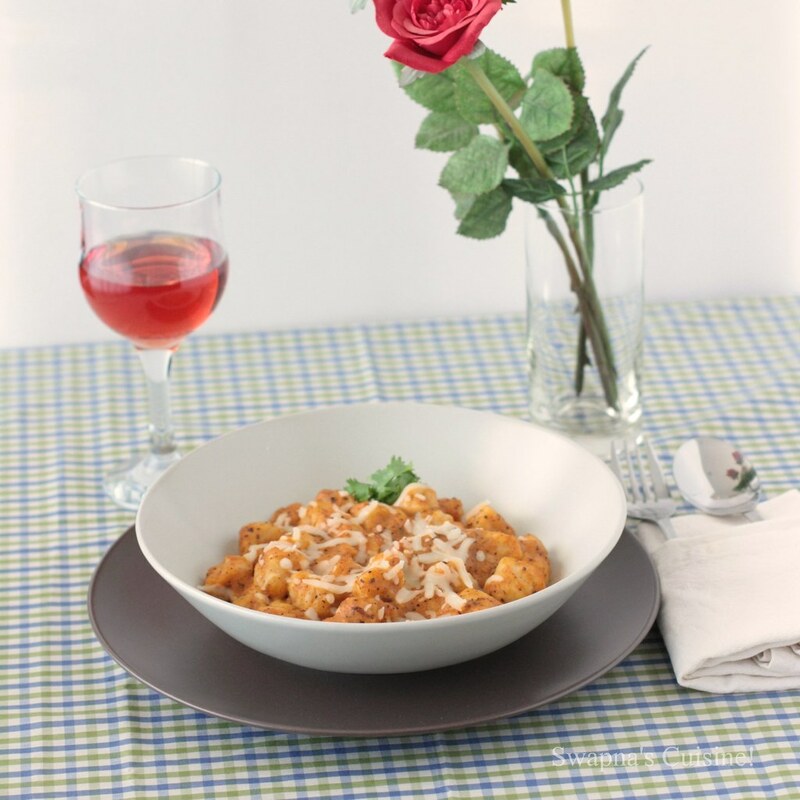 As you work, arrange the gnocchi in a single layer on lightly floured parchment-lined baking trays. Let dry for up to 2 hours. 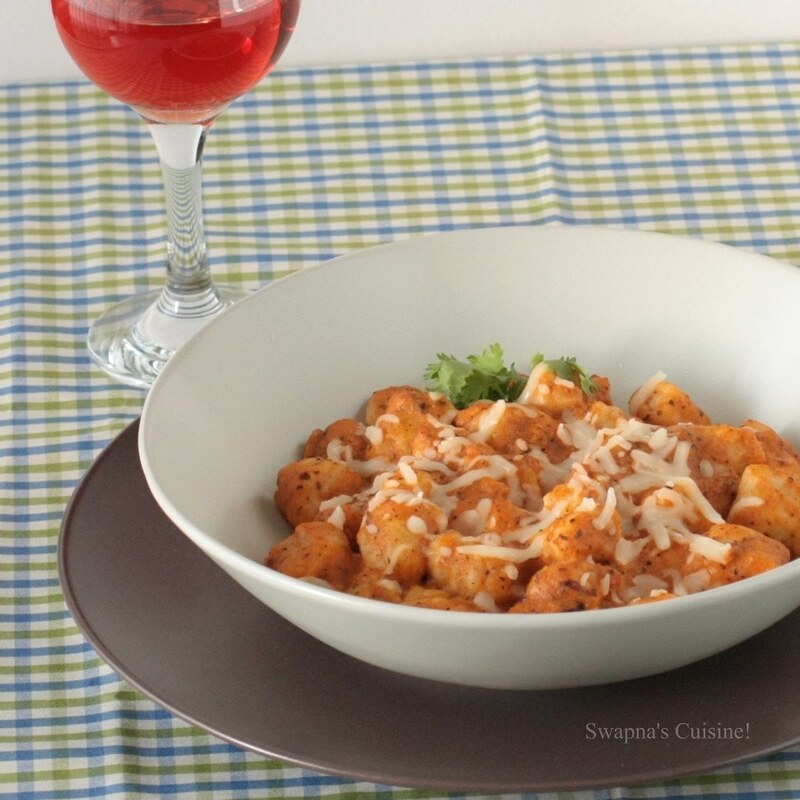 (You can freeze gnocchi in a single layer on a parchment-lined baking tray and transfer to a zip-loc bag when frozen. You can store frozen for several weeks. Cook straight from the freezer—do not thaw). Cook the gnocchi in 2 or 3 batches in a large pot of boiling, salted water, stirring occasionally, for 2 to 3 minutes, or until they float to the surface of the water. Remove the gnocchi from the pot using a wire skimmer. Serve immediately as desired. 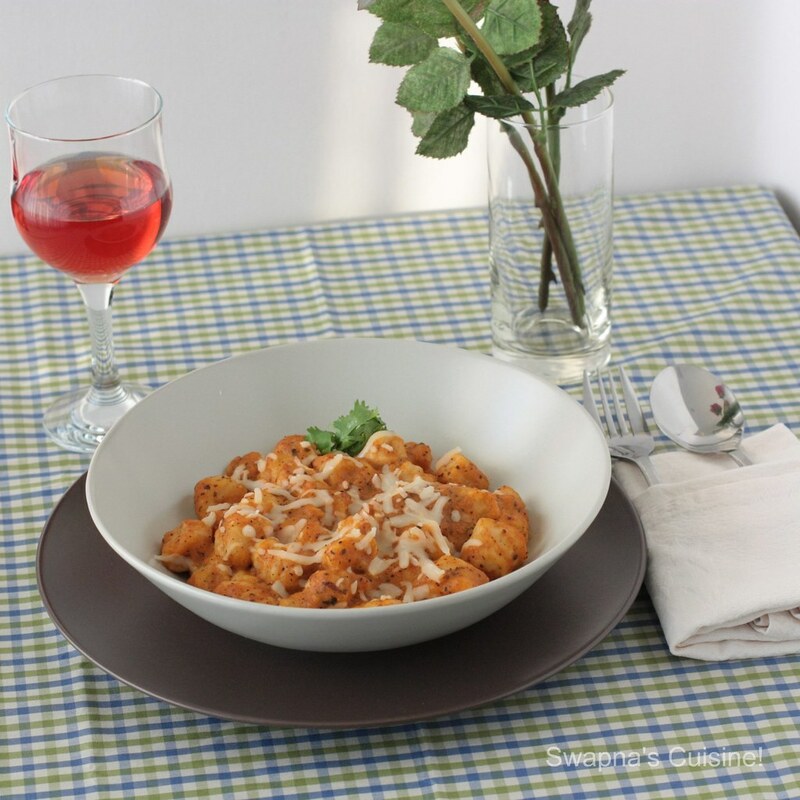 (Please refer Lucy’s post to read her tips for making soft gnocchi). Cook the gnocchi in 2 or 3 batches in a large pot of boiling, salted water, stirring occasionally, for 2 to 3 minutes, or until they float to the surface of the water. Season the sauce to taste with salt and pepper and discard the basil sprigs, (if using fresh basil). When the gnocchi float to the surface of the water, using a wire skimmer, transfer them from the pot to the sauce and gently toss to combine. Remove from the heat, let cool for a few minutes and stir in the mozzarella. Arrange on individual plates, top with plenty of Parmesan cheese and basil, and serve immediately. That sounds seriously yumm :-) How is the X'mas preparations going on ? wine okke ready aano? never tasted or tried before!!! Yumm.. Italian is my all time fav!!!! It looks very creamy and delicious!! 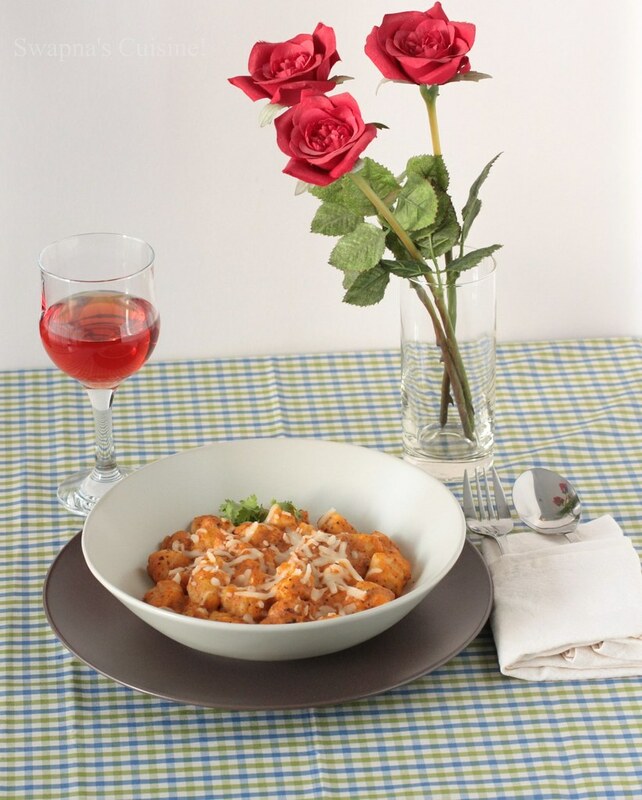 Lovely looking Gnocchi's ...my mouth is watering...i luv this one.. Honestly, I've never tried gnocchi. But after reading your love for this dish, I'm really tempted to try. And who doesn't love potato!?? 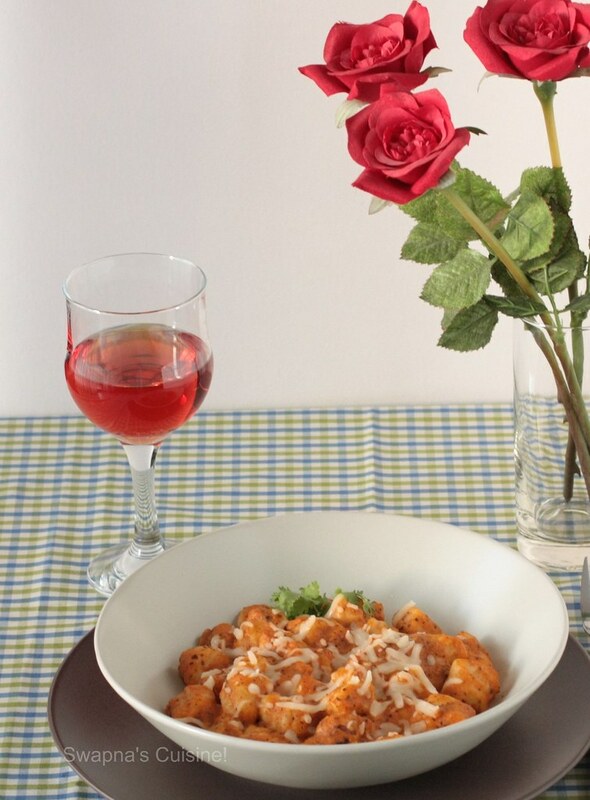 Give me that whole plate,i'll finish it rite now..
Gnocchi is pure comfort food and tomato cream sauce just puts it over the top!